Earlier this Summer my family and I went camping at a state park in Wisconsin, where I have been camping since I was in Kindergarten. Even though we have a pretty nice camp setup with a large tent and cots, with two toddlers in tow, it was not your definition of glamping. Some day I’ll make my glamping dreams come true with the ultimate luxury experience. 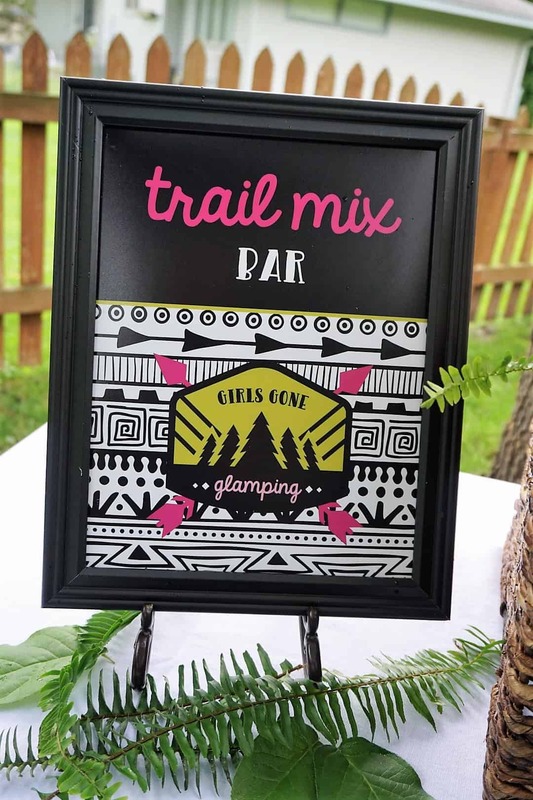 In the mean time, imagine my delight at getting the opportunity to create a fun Girls Gone Glamping Party with some other local party stylists, Holly from Legally Crafty, and Twin Cities event planner, Lisa Murphy. 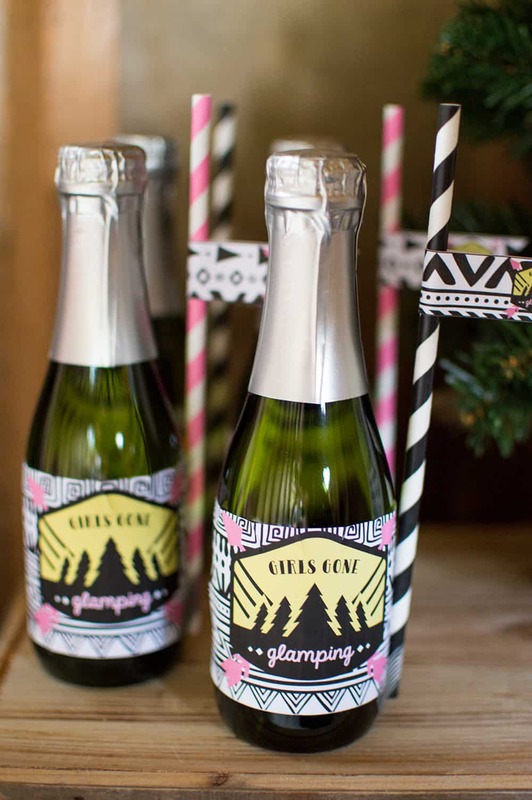 Grab your girls and check out these glamping party ideas for your own outdoor fun! As always, once a theme is decided we thought about the look we were going for. 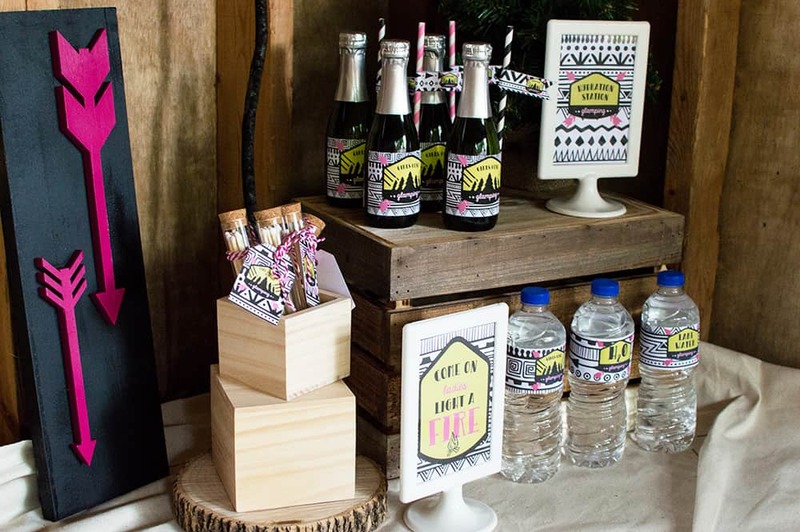 We settled on a Boho chic vibe using a color scheme of black, white, green, and pink. 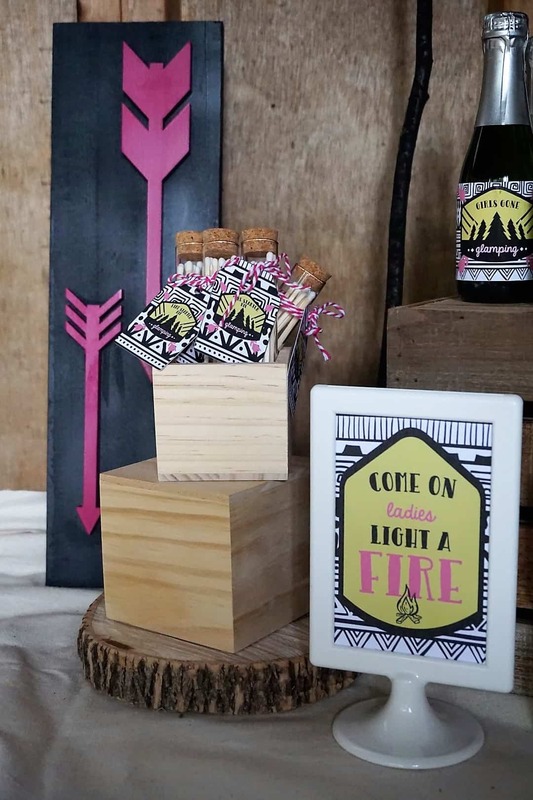 I love the pops of hot pink throughout the printables and party decorations and using a mix of fonts, including a cursive script, to repeat across all of the party printables. 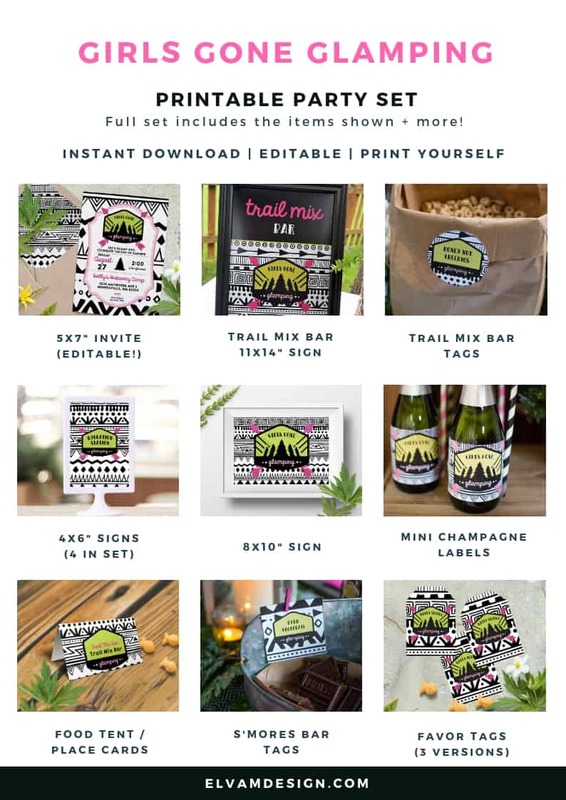 I was so excited when I came across the Boho pattern I used as the background in the printables and was even more ecstatic when we found similar prints within the rest of the party decor. Finally, we wanted to use a lot of greenery to bring nature to the forefront of the party. The entire look is definitely boho chic meets the outdoors. 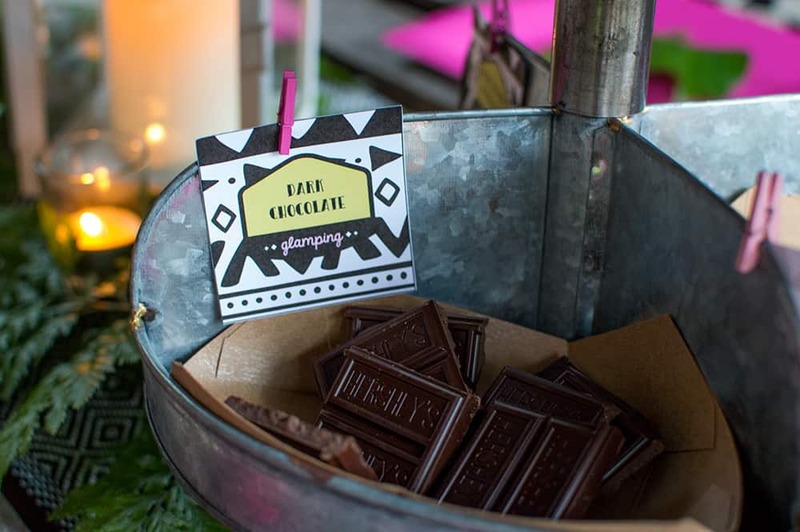 You don’t have to leave your own backyard to throw an amazing glamping party. Use what you have! 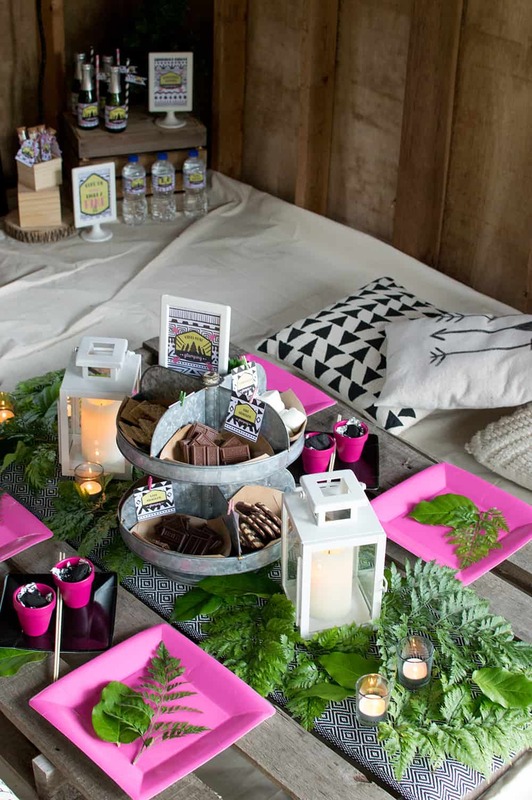 While Holly has an amazing clubhouse in her backyard that was the perfect space for some wining and dining, you can create your own glamping space with an ordinary camping tent or simply throwing down a canvas drop cloth, like we did to cozy up the space. 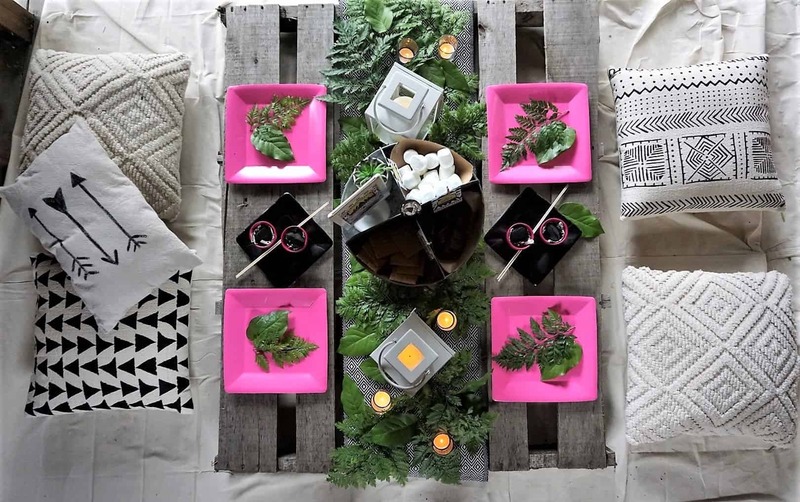 Using a pallet as our table, we layered on an Ikea table runner (one of those amazing finds with a fun black and white print), and fresh greenery, which Lisa has an amazing talent of arranging. 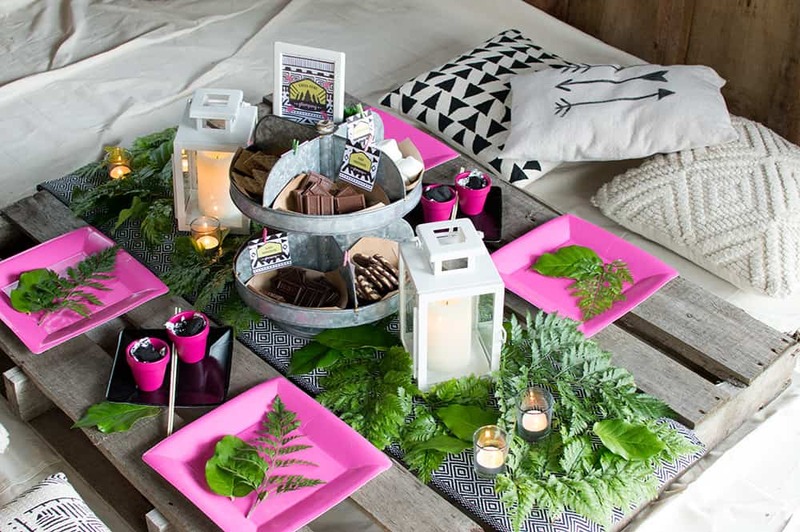 Lanterns, candles, s’mores station and ingredients (more on that in a bit), and a place setting for each guest, along with comfy pillows, from Hobby Lobby and Holly’s collection, complete the look. What’s camping without some ooey gooey delicious s’mores? 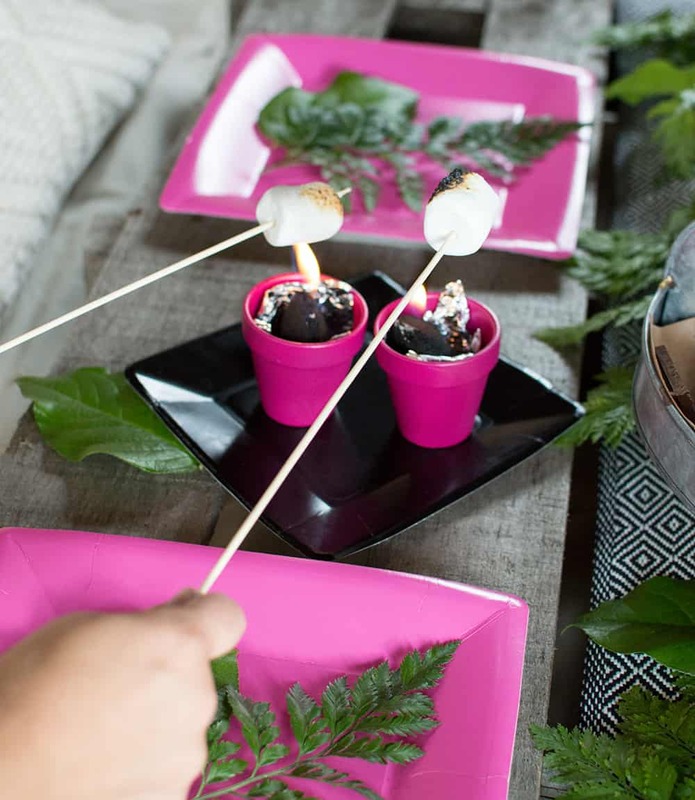 But these aren’t just ordinary s’mores. 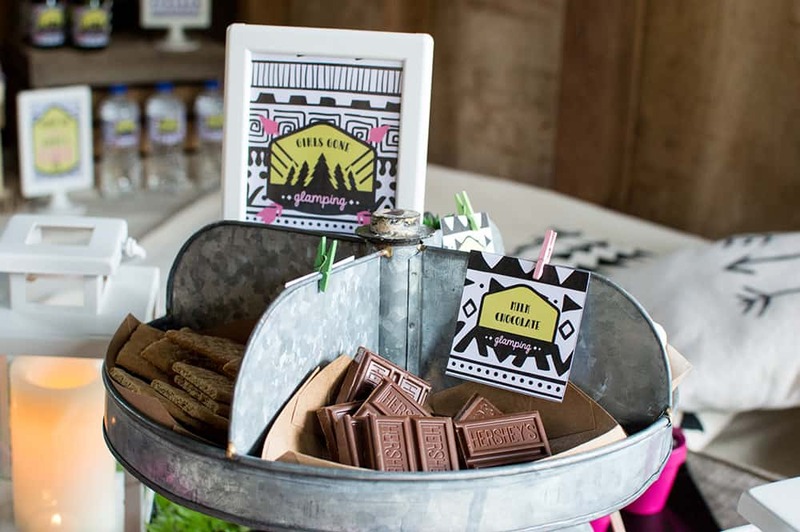 We took it up a notch with some gourmet goodies, including dark chocolate, Reese’s Peanut Butter Cups, and striped cookies. 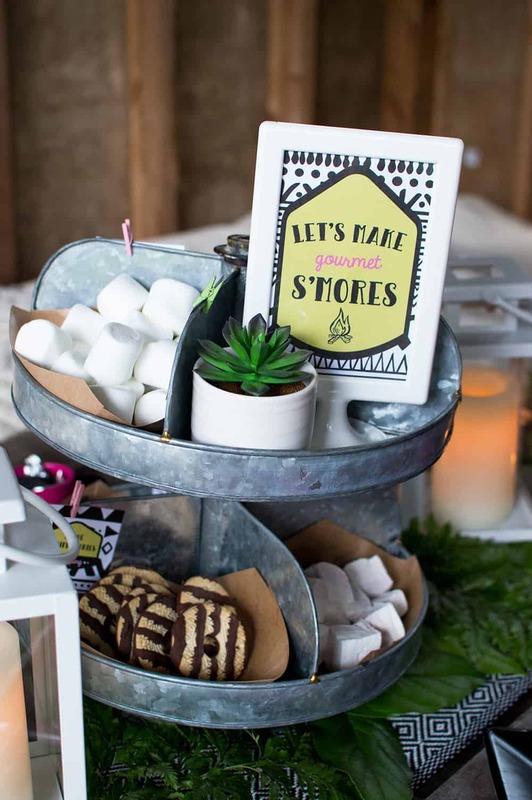 I placed all of the s’mores ingredients in a galvanized metal tiered tray I picked up from Home Goods earlier in the Summer. I love how it spins, making all of the ingredients super accessible for all party guests. 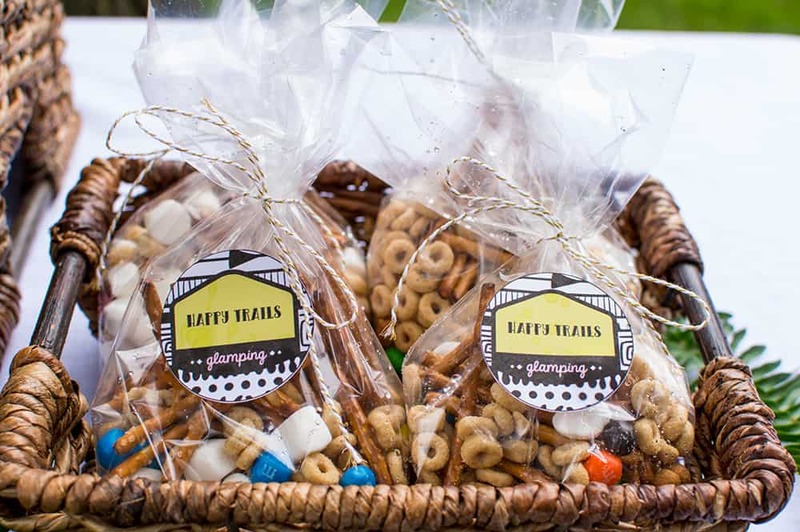 I used some paper food trays that were leftover from the Lumberjack birthday party in each section and then filled each with the ingredients, with little tags to identify each option. Of course there’s also a party sign directing guests to the yumminess ahead. 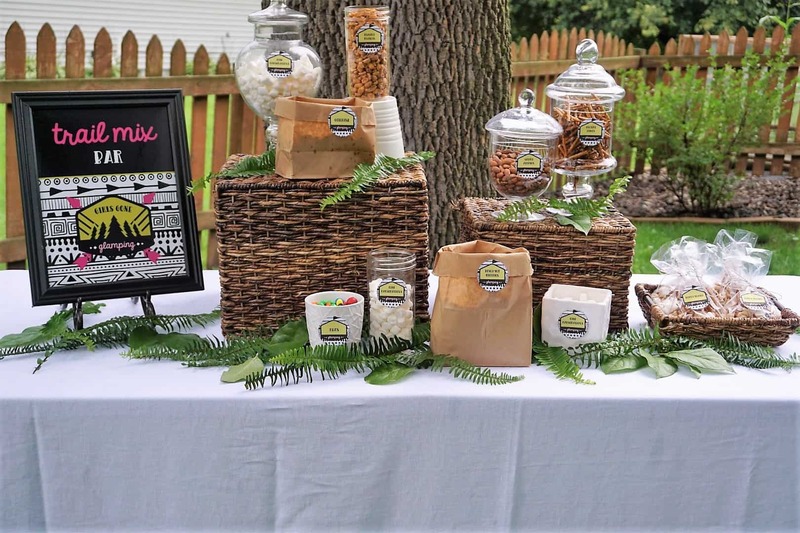 Each table setting had individual s’mores stations, no campfire needed! 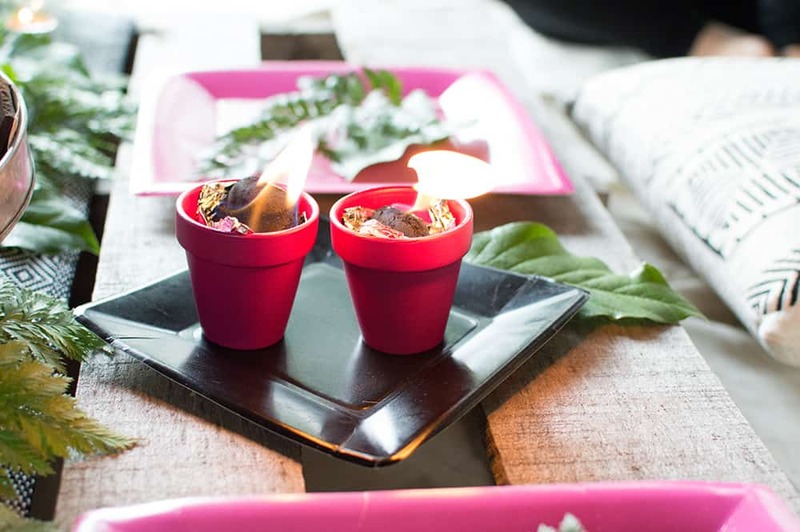 Holly has a DIY tutorial on her blog to help you create your own. Don’t forget to use some lighter fluid to get these babies started, and use precautions. We had some heavy duty gloves on hand to handle these — they get hot! 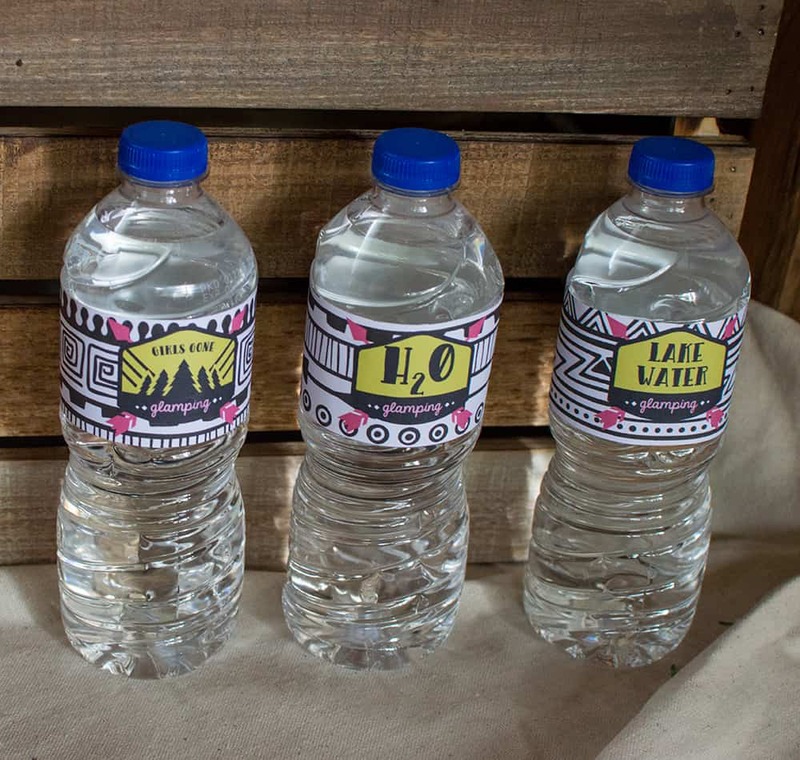 It’s important to stay hydrated when glamping, and my beverage choice is always champagne. 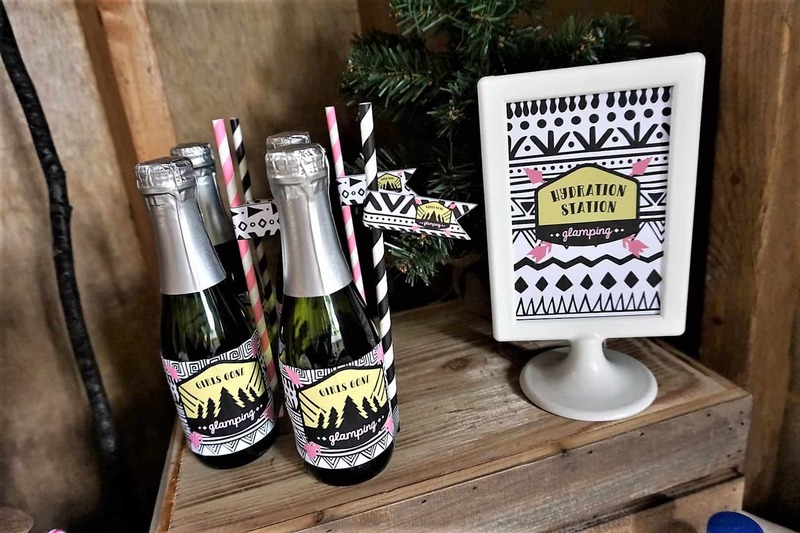 I styled a hydration station with mini champagne bottles and water, both dressed up with custom labels. 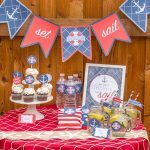 The champagne bottles also had my signature straw flags. You know what’s funny, though? I find it incredibly hard to drink champagne out of a straw because it tends to get super fizzy and overflows. Do you have that problem? 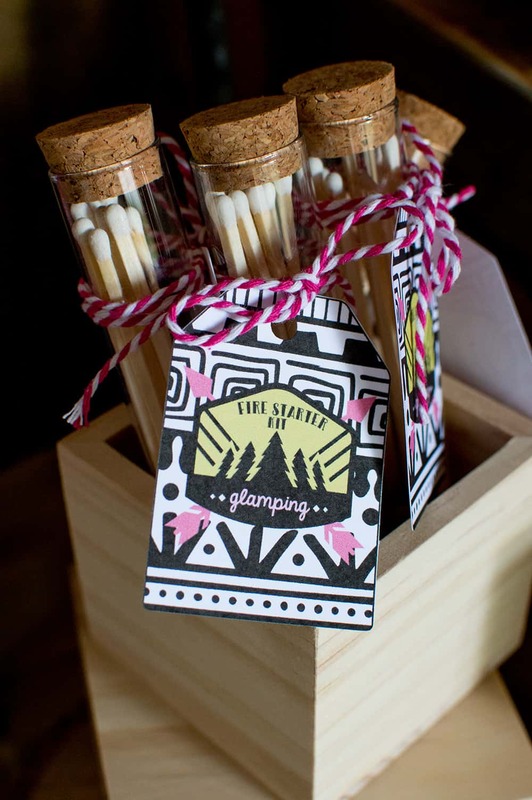 We sent our guests home with some mini fire starter kits that Holly put together. 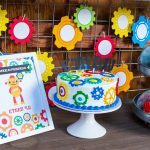 The details on how she made them can be found over on her blog, Legally Crafty. I love how cute they look with the little fire start kit tag I made. 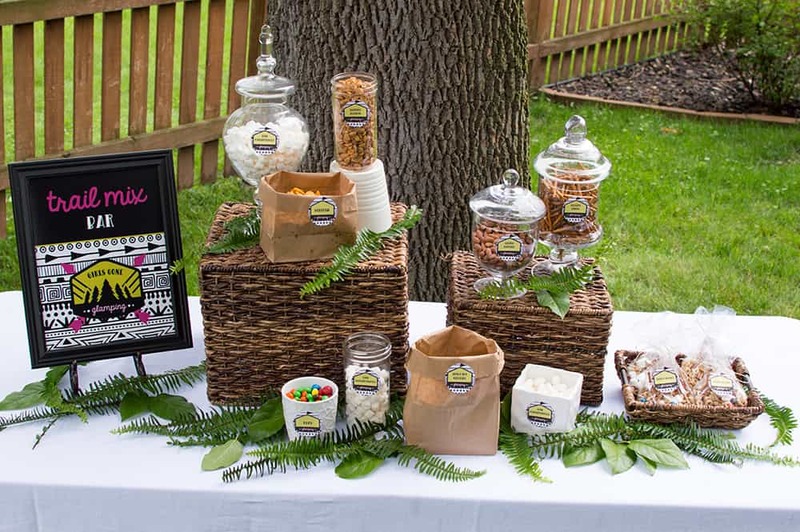 You’re sure to work up an appetite when out in the “wilderness.” Lisa put together this gorgeous trail mix bar to keep guests satiated. 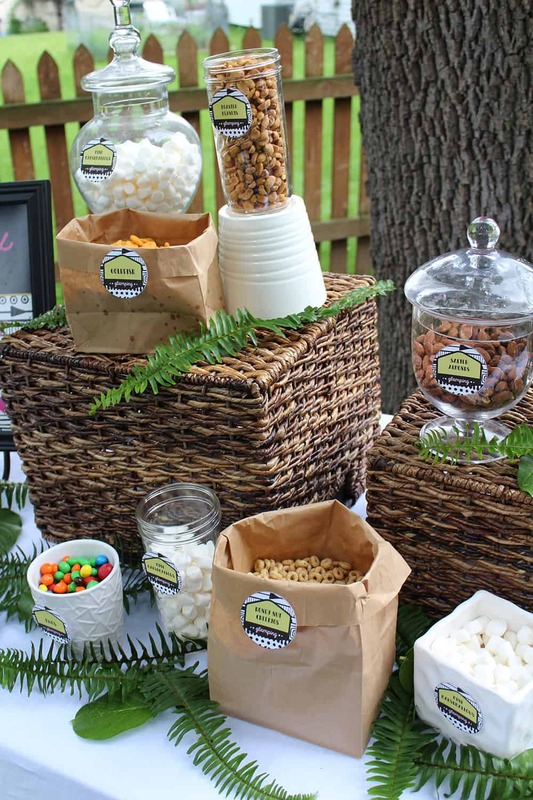 Using a variety of jars, paper sacks, and containers, along with baskets to add height, the trail mix bar is elegant and full of nutritious and delicious goodies, like goldfish, nuts, cheerios, marshmallows, pretzels, and M&Ms. 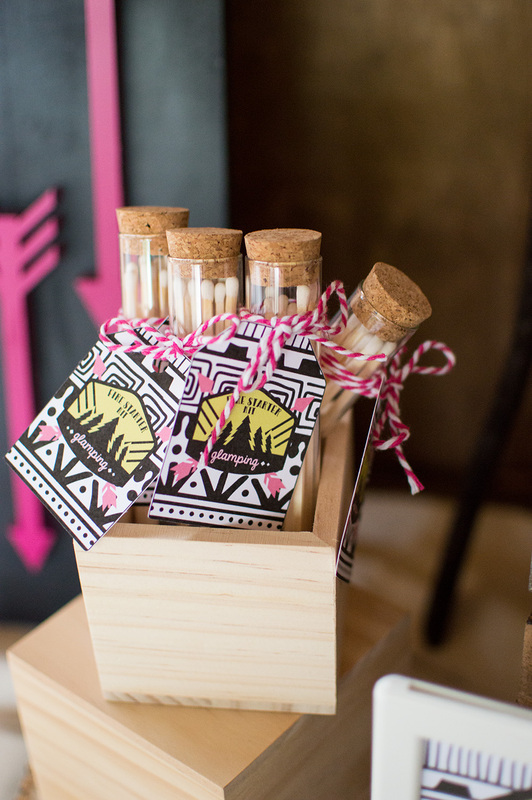 Don’t forget to have little containers or bags on hand so guests can create their own blend. 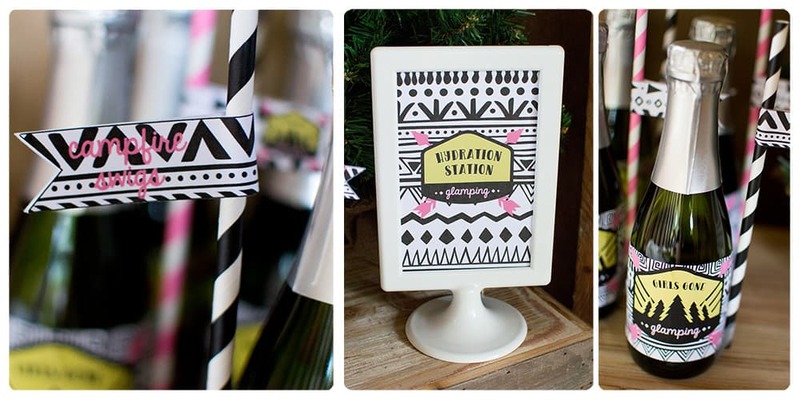 Fresh greenery and neutral colors on the table make the party sign pop. 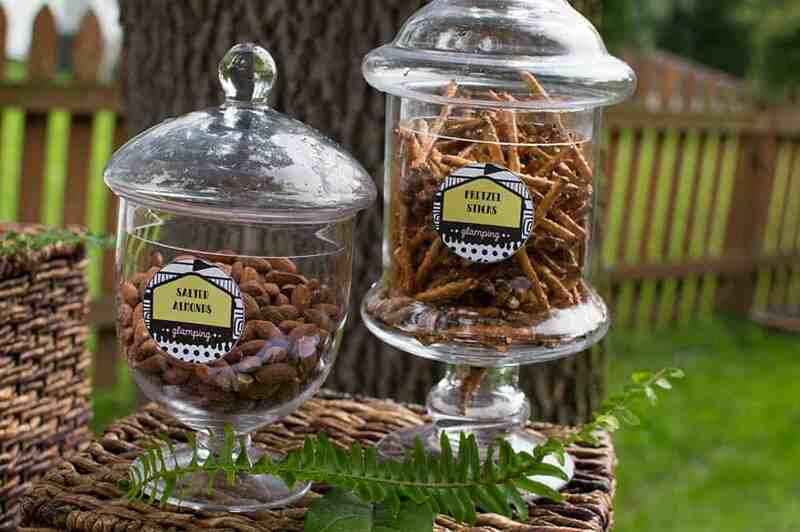 You can get a Trail Mix Bar sign like this printed at Costco for under $6. 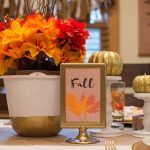 Just use a frame and easel display stand and your table is all set. 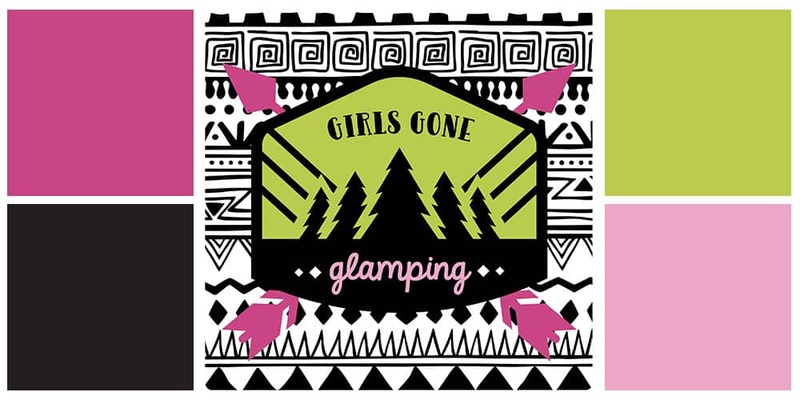 Hope you enjoyed this Girls Gone Glamping Party. It really doesn’t take much to enjoy the outdoors in style. 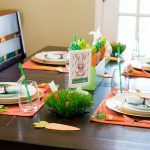 The key ideas to keep in mind are to soften up your space, serve yummy food and treats, and a fun drink whether this be alcoholic or a yummy mocktail. The choice is yours! Add a variety of apothecary jars, baskets, and wood crates and containers to complete the look.